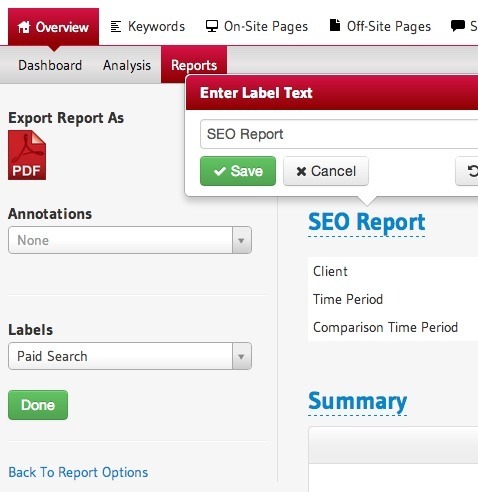 We have provided the flexibility for you to modify the sectional labels in the SEO Report. For agencies that support clients in multiple languages, then you can know relabel our labels in Spanish or French for example. You can then save those customizations and then apply those to multiple clients. Other agencies have wanted to rename certain labels for example, Paid to “PPC” or “Reach Local” and Other Traffic to be relabeled to “Constant Contact” as they use Constant Contact and most of their “other” traffic was from their email campaigns. When you apply these settings to your clients, they would then be applied to any scheduled reports.